Technological advancements are dramatically changing the course of manufacturing. Most modern production techniques are controlled by computers and data. The nature of the industry is shifting, and it will impact how products are designed. As business continues to globalize, companies will need to figure out how to move their products to new market, according to Engineering.com. Decentralized manufacturing may become more common, and this will require a higher degree of connectivity between supplier partners. Firms will rely on digital representations of prototypes, and the products themselves will be more technical. Even many modern home appliances have computer processors, and the trend is here to stay. High-tech products will require a greater deal of collaboration to ensure functionality. This term is most commonly associated with 3D printing, but cold spraying is another technique with the potential to impact how things are made, The WSJ said. This process involves shooting metal particles through a nozzle at high speeds so they bind together and form shapes. Machine operators can make metal objects by precisely controlling the nozzle, similar to 3D printing. Cold spraying can even be used to create objects with exotic metals like titanium. 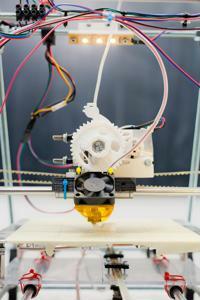 3D printing is quickly evolving as well. Machinery has developed to add layers of different materials, such as hard and flexible plastics, ceramics and metals. A German manufacturer found a way to print layers of wood pulp, and 3D printing is even being used to make artificial organs. Some printers can add layers of more than one material. Additive manufacturing is a way production firms may be able to improve quality. Manufacturing has traditionally been resource and raw material-intensive, but engineers are making efforts to reduce the waste and energy usage. Production may shift toward more "lights out" facilities that do not need heating or cooling because they are operated by robots and machinery. Sustainability efforts in manufacturing could focus on recycling, since small-business manufacturing will depend on the availability of local raw materials. Factory sensors help monitor agile machines, and can allow the process to become more efficient. Better sensors can prevent issues from cropping up during production. Managers have better product-tracking capabilities. Electronic sensors and microprocessors have dropped in cost, allowing technology to be more accessible to smaller manufacturers, according to The Street. New technological developments have given manufacturers greater flexibility. Such improvements are leading the manufacturing revival in the U.S.
Nanomanufacturing will give firms the ability to arrange materials on a miniscule scale, potentially on an atomic scale, The WSJ said. In the future, nanomanufacturing is expected to be used in high-efficiency solar cells and batteries and could have implications for medical technology and other electronics. Biomanufacturing involves taking a biological organism to make a product, such as pharmaceuticals or medical compounds. It could have implications for energy efficiency, and this technique could evolve alongside nanomanufacturing. Traditional manufacturing techniques such as casting, forging and welding may have room for improvement. Many mechanical manufacturers depend on these methods, and there is room for new developments that would improve energy and resource efficiency. Cold forming could take the place of advanced welding, and companies could achieve material cost savings. The process involved punching out sections of iron, often at room temperature, and complex shapes can be produced.